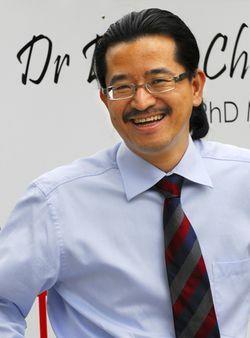 Dr Chen recently sold his successful clinic in Taiwan and relocated to Australia with his family. He brings 20 years clinical experience to his Bentleigh practice. Dr Chen’s clinic uses machines with advanced technology to cook and pack the herbal medicine which means that prescriptions are properly prepared and hygienically sealed in accurately measured doses. This is safer, more effective and more convenient for patients who in the past have had to measure, cook and stew their medicine at home. Dr Chen’s treatment provides instant relief from pain and uncomfortable symptoms. Treatment programs stimulate the body’s self-immune system, activating the body’s self-healing ability to repair and rejuvenate. Dr Chen’s treatment techniques empower patients to participate in their own healing process, allowing them to manage their pain and be involved in their treatment between consultations. Dr Chen uses Auricular Acupuncture and Kinesio Taping to facilitate ongoing treatment once the patient has left the clinic. Auricular Acupuncture is needle free. Tiny beans are taped on the relevant pressure points of the patient’s ear. The bean points can then be pressed to stimulate the flow of ‘Chi’ (energy) and ‘Xue’ (blood) as needed to manage pain and directed to promote healing. Kinesio Taping involves taping affected areas with strips of Kinesio tape to stimulate healing and support affected areas. Dr Chen’s treatment programs also include Balance and Scalp Acupuncture, Herbal Medicine, Traditional Chinese Medicine, Tuina Massage (Chinese massage – a sophisticated medical massage used to treat injuries, joint and muscle problems and internal disorders), Moxibustion (an oriental therapy utilizing moxa, or mugwort herb) & Cupping.